I never know what to do with the abundance of fruit we get from our Fuyu persimmon trees every year. I make bread and cookies out of them, but honestly, there are only so many baked goods a person should have around the house. I can’t give them to neighbors because we all have persimmons and they all become ripe at the same time. It’s either feast or famine, from a persimmon point of view. This year, we donated the majority of our fruit to a local non-profit, Food For Thought, which provides food to people living with HIV/AIDS. But I also set some aside to learn something new. 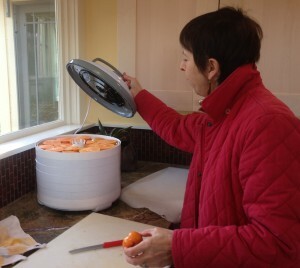 My canning buddy, Mary Radu, suggested we use her dehydrator to dry some for use during the non-persimmon season. I went to her house, loaded with persimmons and expecting another full day of work and education. To my surprise, it was easy. We just washed the fruit, cut them into the thick slices that show off their beautiful star pattern and put them on the trays in the dehydrator. The time-consuming part is just simply waiting for the machine to do its magic, which can take up to 24 hours. But I had a lot of persimmons, little patience and no freezer to store them in. So I found a terrific recipe from Martha Stewart for drying the persimmons in the oven. You have to use a higher temperature than a dehydrator, so you do lose some vitamins. And their texture is more like a dried prune, depending on the thickness of the slices. But adding some cinnamon to the slices before cooking makes for a particularly festive, homey and delicious snack. With the decorative star pattern that becomes even more prominent after drying, we plan to include our abundant fruit in all of our Christmas celebrations in the years to come.